The statue was found damaged this morning. Soon locals gathered at the spot and demanded immediate arrest of the culprits. Police said efforts are on to identify those behind the incident. 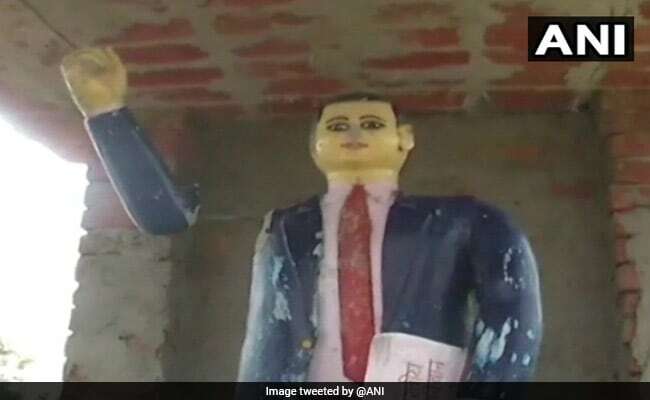 Siddhartnagar, Uttar Pradesh: Unindentified persons vandalised the statue of B R Ambedkar in Gohaniya village, triggering protests by locals, police said today. The statue is being replaced and a case has been lodged against unidentified persons, SP, Dr. Dharamvir said. Efforts are on to identify those behind the incident, he said. Domariyaganj MLA, Raghvendra Pratap Singh, who rushed to the village soon after the incident, alleged that it was a conspiracy hatched by the Samajwadi Party and the BSP and the culprits will not be spared. Chief Minister Yogi Adityanath is scheduled to visit the district on April 2.